Woohoo - another item to check off the to-do list! 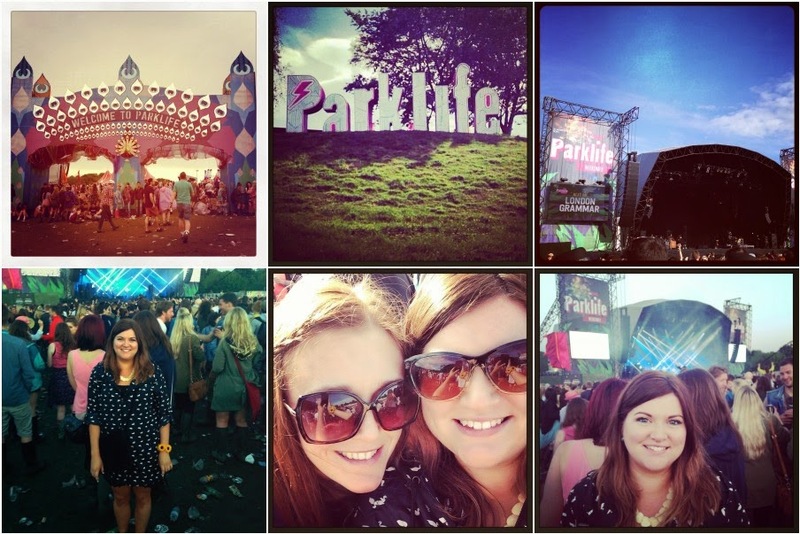 I went to Parklife last Sunday and experienced my very first festival! Despite some of the weirdest weather I have EVER witnessed.. blazing sunshine, then grey skies, then horrendous downpours and then a beautiful sunset(!) I had an amazing time and I was way more ok with portaloos than I thought I would be! We headed over about 4pm as we were most interested in the acts later on in the day, grabbed a 'Parklife Burger' from Almost Famous and listened to the vocal talents of London Grammar, Bastille and Foals. Upon reading the #parklife hashtag on Saturday night I was a little dubious as to what to expect and apart from a bit of confusion about where we should be queuing to get in I thought it was fine! It is always worrying when you read about things that have happened and I must admit I was a bit anxious about whether I would see any fights or trouble! One thing I did think was hilarious though, was that my sealed nurofen were taken off me, as categorically no tablets were allowed in the festival! There were a fair few people who were quite evidently on substances other than alcohol, but nevermind..! I would definitely go to Parklife again and other day festivals, I'm not sure I am cut out for camping but I think being able to go to events like this when they are on my doorstep is great!